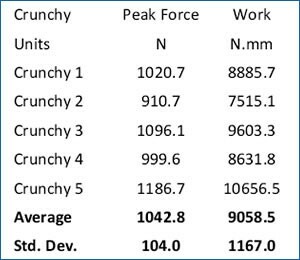 A large processor wanted a way to subjectively measure the differences in their “soft” and “crunchy” products. Current method involves just simple subjective sensory that tends to be inconsistent. Due to the changes in the incoming raw ingredients, the processing method has to be constantly adjusted to produce a consistent product. The texture of a product like croutons is very important to the consumer. Without the ability to objectively measure this characteristic, it is impossible to control it during processing. It was determined that because of the variation from piece to piece, the Kramer Shear Cell would work best. 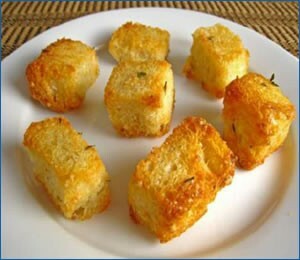 Instead of testing one crouton at a time, several were tested together so the result is an average of the pieces. This helps to compensate for the variation in the product. For this testing, we used a TMS-Pro Texture Analyzer fitted with a 2500N load cell and the CS-1 Kramer Shear Cell. This method could also be used with any of FTC texture system. For each replication, 5 grams of product was weighed and place into the shear cell. The pieces were arranged so that they made one even layer in the bottom of the cell. Once the tests were completed, calculations of the peak force and work were made.